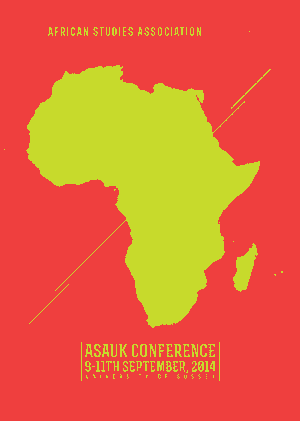 As part of our ongoing series on the ASAUK 2014 conference, Rebecca Jones reports on panels on African languages in literature and in the disciplines. Papers that discussed African languages could be found throughout the ASAUK 2014 conference – including panels on Swahili newspaper cultures, and on new developments in Shona literature – but there were two panels I was able to attend that were specifically interested in methods of working with African languages: a panel on Comparing Afrophone literatures, convened by Sara Marzagora and me; and a roundtable on the role of African languages in the disciplines, organised by Carli Coetzee. The panel on Comparing Afrophone literatures and intellectual traditions was designed to explore the ways in which we might compare (and contrast) African-language literatures and intellectual traditions with one another, rather than primarily with Western literatures, and so build up literary histories and theories based on cross-cultural comparisons between African language literatures. We wanted to make space for conversations about the very idea of comparison between African language literatures. Is it worth doing? How have Afrophone writers and intellectuals been influenced by other African-language traditions? How have debates about literature been shaped by other Afrophone traditions? Did Yoruba authors ever read (or hear about) Hausa literature, or Amharic writers Swahili literature? Where did translation from one Afrophone language to another take place, or where were different Afrophone literatures published alongside each other? While not seeking to claim that African-language literatures must necessarily have anything in common – the continent is clearly far too diverse for everything to be connected – we were convinced that we could trace some of the links that do exist. Although our panel could only ever begin to explore such broad questions, we were delighted to have papers which encompassed a range of African languages, from Yoruba, Kanuri and Hausa from West Africa, to Arabic, Gikuyu and Swahili in East Africa. Flavia Traore explored the fascinating and interlocking history of the novel in Gikuyu and Swahili, and in doing so asked us to question the association between nation, language and literature. She suggested we examine the role of multilingual writers as translators (in both a literal sense and as intellectual translators), and not only between African and European languages, but also between African languages. Comparing the novel traditions of Gikuyu and Swahili, Flavia pointed to differences of historical context and language policy, but also a shared interest in history and political issues, particularly the memory of the Mau Mau uprising, disillusionment towards the ruling class and anti-imperialism. There was also a trend towards experimental novels with fantastical, satirical elements. Next was Serena Talento on how translation of 18th and 19th century tendi (Islamic classical narrative poems) from Arabic to Swahili was viewed as a source of prestige. For the translators, presenting one’s work as a translation from Arabic could give it legitimacy, and a meta-discourse on translation emerged. One striking way they described their translations was through language of the heart: love, longing or desire to translate. While they adopted some elements of a socially prescribed humility, they also wanted to be seen translating because it was regarded a prestigious act, owing to its association with external origins. Some original poems were in fact therefore presented as translations to afford them greater prestige. Serena also pointed out the necessity of understanding terms such as ‘translation’ from the point of view of Swahili (in which the word ‘tafsir’ refers to explanation or commentary) rather than simply from the English sense of equivalence. Rotimi Fasan compared traditions within Yoruba drama. Yoruba drama has its origins in ritual and in the itinerant Alarinjo performers, and out of this developed a mythic drama tradition, often unscripted. However, a parallel and less-recognised tradition emerged from the 1940s in the form of (scripted) protest or political drama, first practised within the Alarinjo tradition but later by university-influenced practitioners such as Akinwumi Isola. Rather than exploring the mythic, they engaged with the everyday and the political. Nonetheless, they still sometimes contained elements of the metaphysical and ritual. There were many interesting comparisons to be made between Rotimi’s paper and Flavia’s on Gikuyu and Swahili literature, particularly the complementary roles of realist, mythical and fantastical literature, and the blurred boundaries between them. Our final speaker, Clarissa Vierke, brought us back to the role of Arabic in Swahili and other African-language literatures as she explored Islamic narrative poems. In her extremely well-researched paper, which I don’t have space to do justice to here, Clarissa explained how certain texts, motifs and narrative types have circulated throughout Islamic Africa, and she made some fascinating comparisons between poems in Arabic, Swahili, Kanuri and Hausa. Nonetheless, she pointed out, poems were not simply imported wholesale, but adapted so that they made sense in local contexts. Clarissa pointed to numerous important directions for further comparative research in this vein, highlighting the need to think not only in terms of languages but also religious cultures, and also opportunities to look at audiences, readerships and performances of such texts. Overall, the panel left us with not only new ideas about the interactions and comparisons to be made within and between African-language literatures, but also the many different ways we might theorise these interactions: as exchange, translation, imitation, pseudo-translation, through generic experimentation, and influenced by shared or equivalent political and social histories. Exciting conversations between Kikuyu, Swahili, Arabic, Hausa, Kanuri and Yoruba literatures at #ASAUK2014 #ComparingAfrophone panel today. The roundtable on African languages in the disciplines turned its attention to the role of African languages in Africanist scholarship, tackling a question which is very familiar but clearly has still not been dealt with as the panelists would have hoped: how do we give African languages the central place in Africanist research that they surely deserve? The panelists – Karin Barber, John Mugane, Innocentia Mhlambi and Walter Bgoya – took two related but different approaches. Karin Barber argued that we need to recognise the pleasure that goes along with speaking, reading and researching an African language, rather than only regarding it as a responsibility – especially since speakers and writers of African languages themselves often find so much pleasure in them. The other panelists described the important work that had gone into raising the scholarly and literary profile of African languages, more along the lines of the ‘responsibility’ approach. John Mugane described his experiences with the African Languages Programme at Harvard (which offers 24 African languages), while Innocentia Mhlambi discussed the work that had gone into raising the educational profile of African languages in South Africa, where from next year, children will be taught in African languages for the first four years of their education, ‘which for us, has been a very great struggle’. Walter Bgoya, meanwhile, described his experiences as a publisher of African languages (for more on his publishing, please see our earlier review and interview). While there were no easy answers to how one might go about changing the relatively low profile of African languages in the disciplines (although all the panelists’ own work in this field certainly provides a model), the panel were convinced that it remains an important area for future work, whether out of the responsibility – John Mugane suggested Africanist scholars should take responsibility for challenging our colleagues who haven’t at least attempt to learn an African language – and/or the sheer pleasure. ‹ Mxolisi Nyezwa’s ‘Malikhanye’: Are there words?